Find hotel near Windsurfing In Agios Geor .. 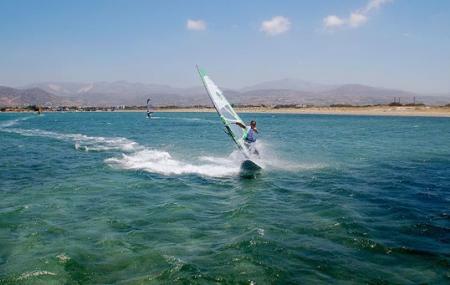 If you are feeling a little too adventurous, head over to any one of the villages’ exclusive Windsurfing Centers located conveniently along the Agios Georgios beach. The region is known for its unique training sessions in wind-surfing and not trying your hand at it is simply missing out on its highlight. The place offers personal training in windsurfing and is a rare experience especially during the summer months from July to August. Do book an appointment well in advise to make sure you have a slot even during peak season. Carry a change of clothes, drinking water and sunscreen with you. Call up the place to know about entry, training and rental prices. How popular is Windsurfing In Agios Georgios? People normally club together Issos Beach and Kazzoo's Cocktail Bar while planning their visit to Windsurfing In Agios Georgios.